Yesterday, Fellow work colleagues Doctors and I as the "Front of Desk" went for some Product Training regarding these two Brands Medik8 and SVR. Starting off with two hours of Medik8 Training, Naomi who was representing Medik8 gave us an in depth idea of what Medik8 actually stands for and what and how their products work and target. I was blown away with cleansers and toners and products that can treat redness and acne. We all went away with a cleanser, the GENTLECLEANSE. I will be shortly reviewing this myself and let you in on my opinion. Next onto SVR Training which was held at PharmaMT same place who bring Catrice and Essence in Malta which had held our blogger events last year. SVR cater for many different products and we were asked if we were interested in anything in particular. Being that i am crazy about beauty products i couldn't help but ask about their makeup range. Elisa kindly offered their Compact foundation and also their tinted moisturiser both SPF 50! Also we were all given some little testers to try and i walked away with a little Rubialine tester which is for Redness-prone skin.. Reviews will be coming shortly. 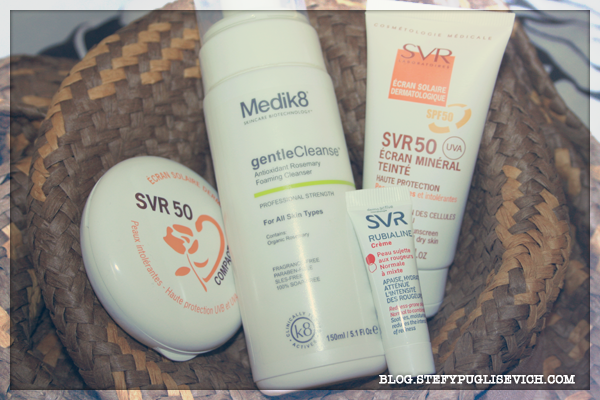 WHAT DO YOU THINK OF SPF IN BEAUTY PRODUCTS?